The Wizard of Oz slot machines can be found in all the Las Vegas casinos as well as New Jersey, in Atlantic City. They are some of the best loved games ever to grace the casino floors, all over the USA. 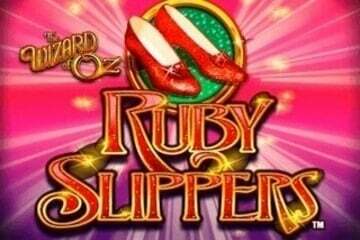 Ruby Slipper is the follow-up game to the original Wizard of Oz slots. This one is also a 5 reel game, although you can also find a 3 reel one in Las Vegas casinos, which is also great fun and massively popular. The bit I really love about Ruby Slippers slots is when you hit the stacked wild bonus. The bonus feature is called (unsurprisingly) the Ruby Slippers bonus. When you hit this feature, the reels start to spin in a strange way and after a second, you know something is about to happen. Then a huge bubble floats across the screen and it gives out a stacked wild. Sometimes the bonus stops at just one stacked wild, but on other occasions, it carries on to 2, 3 or even 4 or 5 stacked wilds. Obviously, getting 5 stacked wilds is rare as hen's teeth, but it must be amazing to see. The Ruby Slippers game in Vegas is also well known for having a huge jackpot attached to it. As with a lot of the really big branded games, though, you must play max bet to get a chance at the jackpot. The fact that this is a max bet jackpot game, gives it a lower general payout than you might get with other slots, so I would say that if you are a penny player, you might like to play this one just for short term fun, rather than as a game where you might expect to get an extended play for your money.